Volkswagen Passat Estate Performance, Engine, Ride, Handling | What Car? Diesels are still the biggest sellers in this market, despite the current debate about their environmental friendliness. Why? Well, a big car that can carry lots of people and paraphernalia needs a torquey motor; however, the 1.6-litre diesel doesn’t quite cut the mustard. It’s an adequate performer, but you often need to swap through the six-speed manual gearbox’s ratios to get the best from it. Even then, it leaves you wanting. We’d recommend the more flexible 148bhp 2.0 diesel. It’s punchy enough to offer satisfying pace and easy overtaking when you want, and pulls willingly from low revs. So much so that it’s not worth paying extra for the more powerful 188bhp version, unless you really value every last scintilla of acceleration. Speaking of which, there’s the twin-turbo 2.0 diesel for that; with 237bhp and four-wheel drive, it goes like stink. You’ve got four petrol options as well. The 1.4 with 123bhp is too gutless for such a big car; the 148bhp version of the same engine will hitch up its skirt if you rev it out and offer handy straight-line speed. It starts to struggle towing a caravan or climbing steep hills with a fully loaded car, so bear that in mind. The 178bhp 1.8 feels significantly more muscular, pulling strongly from low engine speeds with enough clout to haul five people and their luggage around. Finally, there’s the 217bhp 2.0 petrol; if you’re looking for something quick but also effortless, this engine, with its strong, linear power delivery, will satisfy you. If you opt for one of the lower-powered engines, then you get a choice of manual or seven-speed automatic gearbox. Once you move up to the pokier models, the quick-shifting auto 'box comes as standard. The off-road Alltrack models are available with a manual-only 2.0 TDI 150 or auto-only 2.0 TDI 190 engine. 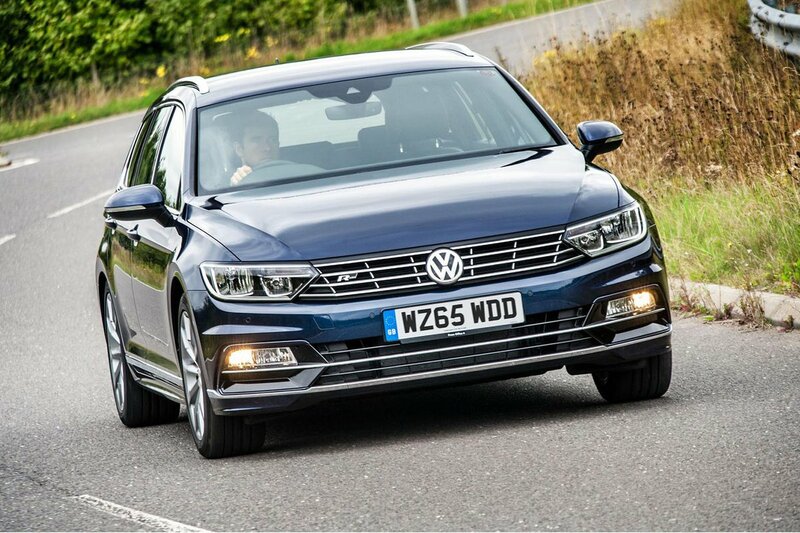 Both can tow 2.2 tonnes, as can the other four-wheel-drive Passat Estates. Front-wheel drive 2.0 diesels will tow two tonnes, and other models less. First, it’s best to avoid the larger wheel options to get the best ride quality. The standard passive dampers give a decent ride, but around town tend to thud over potholes. The optional adaptive dampers offer three modes: Comfort, Normal and Sport. Even Comfort doesn’t quite iron out crumbly town roads, but it does keep things smooth and wafty over bigger bumps and at higher speeds. The ride is still mostly comfortable in Normal, although Sport is the firmest and is best reserved for the smoothest roads. The four-wheel-drive Alltrack and BiTDI models are heavier, so you get a bit more thump on initial bump absorption – particularly in the BiTDI, with bigger alloys fitted as standard. It’s still a settled cruiser, though, whatever model you choose. All models from SE Business trim upwards have driving modes that alter the weight of the steering, the responsiveness of the accelerator, the adaptive dampers (if fitted) and automatic gearbox. 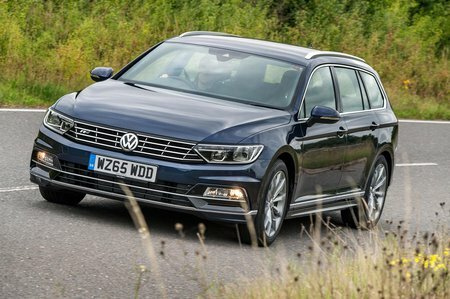 Regardless of setting, the Passat Estate’s steering is accurate and consistently weighted; there’s lots of front-end grip and fairly tight body control. A useful option is the ‘XDS’ electronic differential on front-wheel drive models. It works in conjunction with the electronic stability control to brake an inside wheel through corners, improving grip and traction, and reducing the car’s tendency to wash wide in tight bends. But to really put the power down, you need the four-wheel-drive models, which are much more tractable, stable and relaxing to drive in tricky conditions. Whichever model you choose, the Passat Estate feels composed along B-roads and light and easy when tootling around town. However, for something rather more entertaining, we’d suggest looking at the BMW 3 Series Touring. The manual gearshift and clutch pedal are light and precise, and there’s not too much mechanical vibration, despite the engines being a touch gruff at low revs. The automatic gearboxes are smooth on the move, but can be a bit jerky in stop-start traffic and parking situations. The 1.6 TDI and 2.0 BiTDI are noisier than the other diesels, but otherwise the engines, especially the petrols, sound pretty muted. And once you get up to motorway speeds, the engines fade into the background and wind noise isn’t a nuisance. True, models on 18in wheels generate some road noise over rough surfaces, but it’s not bad enough to become really intrusive.